The Internet of Things (IoT) is growing, and fast. For those that may not know, the IoT is any device that has an IP address. These devices connect and communicate to other IP-driven devices on the Internet. Devices can include cars, drones, watches, refrigerators, and even pacemakers. As the growing number of devices becomes more popular, more companies are finding new ways to create them at a lower cost, which in turn creates a larger consumer base. Business Insider estimates healthcare IoT devices to reach 646 million by 2020; up from 2015’s 95 million devices. According to Becker’s Hospital Review, “In 2009, a mere 16% of U.S. hospitals were using an EHR, but that figure soared to approximately 80% in 2013.” Today, every hospital uses EHR in some capacity. Hospital portals are becoming more common. These portals are the virtual windows that allow clients to access their accounts via their smartphone, laptop, or tablet. Home monitoring systems are popular among the elderly, and most new models come with some form of Internet technology built in. This allows doctors to periodically check patient’s vitals from the computer. Thermometers and glucose meters are also getting the IoT overhaul. Patients can check their stats at home, and then hop on the hospital portal and check how their vitals are looking over any period of time. 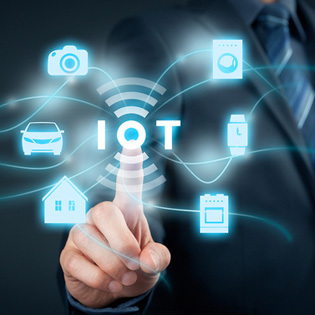 With all of the IoT devices already in effect it would seem there is not much more that can be added. Ah, but there is always more. The new smart beds can track if a patient is in bed when they should be, and report this information to the nurses’ station. Ultrasounds and EKGs can send the information to the network so the information can be viewed by authorized staff immediately. Smart medicine dispensers are entering the market. They know when medication has been taking, and if it is a condition of vital importance, communicates the fact they were not taken to the doctor or hospital. Assisted living residents can have a wrist monitor attached to them that knows if they travel outside of a set boundary. These bracelets also have GPS tracking to locate dementia of Alzheimer patients if they wander off. Much like the bracelet mentioned above, the heart monitor is growing significantly in popularity across all age groups. The iWatch looks to promote wellness in employees. Samsung has watches that connect to your Bluetooth and/or on a 4G network. Yes, these watches can receive texts and make phone calls. Heart rate monitors are built into most smartwatches. The watches monitor your heart rate as you exercise and send the information to the cloud for review at a later date. This information can be looked at by you or your doctor. Many smartwatch manufacturers’ watches are so sensitive that they could determine arrhythmias and other abnormalities of the heart. They will not market the watches this way because they would have to register the watches as medical devices through the FDA. At the same rate, some watches are intended to record your heart rate as you sleep. Determining fluctuations in rhythm throughout the night can help sleep specialists determine if you are resting properly throughout the night. Before long the IoT will be in every device we own. As these devices are developed, they will continue to grow specifically for the healthcare industry as well. Managed service providers have already started preparing for this inevitable undertaking for the healthcare industry. Request a free assessment and find out how TOSS C3 has moved forward toward a stronger healthcare/IoT relationship.